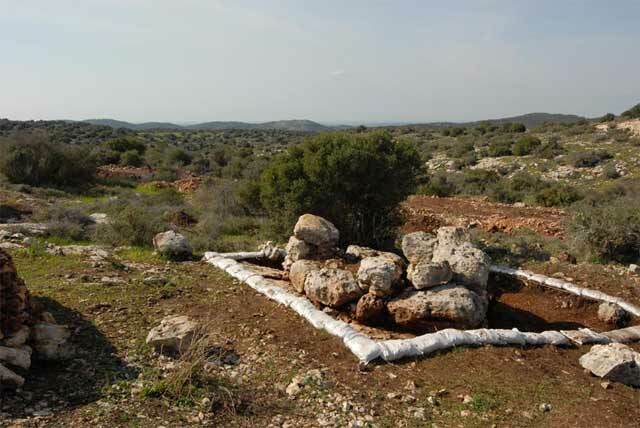 During January 2012, a trial excavation was conducted at the Be’er Khalaf site in Ramat Bet Shemesh (Permit No. A-6398; map ref. 19827/62326). 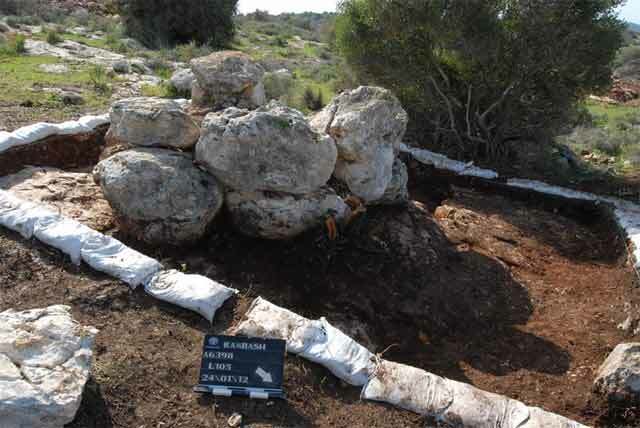 The excavation, undertaken on behalf of the Israel Antiquities Authority and underwritten by the Ministry of Construction and Housing, was directed by R. Greenwald, with the assistance of N. Nehama (administration), M. Kunin (surveying), A. Peretz (field photography) and S. Gendler (preliminary inspections). The excavation area was located on a spur that descends westward (Fig. 1: 1). Remains of a building (Fig. 1: 3) and a road (Fig. 1: 2), dating to the Byzantine period (Permit No. A-6226) and agricultural installations (Permit Nos. A-6309, A-6318), were excavated at the top of the spur. A field tower dating to the Byzantine period was excavated on the spur, north of the site (HA-ESI 123). 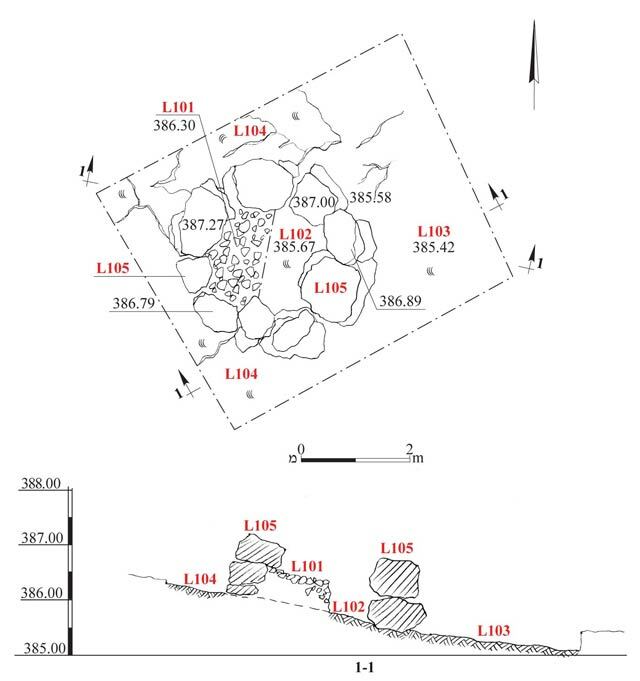 Numerous agricultural installations were documented in a survey conducted in the region east of the excavation area (IAA Reports 46). One excavation square was opened and a round building was exposed in its center (L105; diam. 3.8 m; Figs. 2, 3). The structure, built of especially large stones, partially roughly hewn, was preserved to a maximum of three courses high (1.4 m in the north, 1.2 m in the southwest; Fig. 4). The stones were placed directly on the bedrock, which descends gently to the north (Fig. 5). The structure’s interior was filled with various size fieldstones, piled up in no particular order. The entrance to the structure was not discovered. The bedrock exposed around the building (L103, L104) was neither worked nor had any finds. The buildings and installations in the vicinity of the excavated structure date to the Roman and Byzantine periods and the building may date to these periods as well. 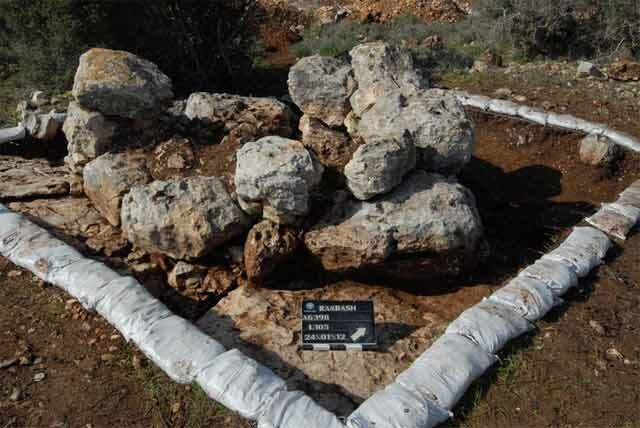 A similar structure situated alongside a winepress and rock-hewn basins was excavated at Horbat Naqar (North) located c. 8 km south of the current excavation (HA-ESI 122). As in the case of the building at Horbat Naqar, the structure at Be’er Khalaf may also have served the farmers in the region. 3. The excavation, General view to the west. 4. The excavation, View to the southwest. 5. The excavation, View to the northwest.